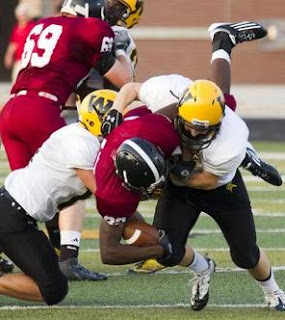 to have a decent shot at upending Olathe North. Tim Callaghan spent years as an assistant at Olathe North before taking the head job at SM West and that always adds a little flavor to this matchup. Callaghan is 2-3 in games against his former school, the most recent of which was a 29-22 loss in week one of last season. While Olathe North looks loaded once again, SM West is off to one of their roughest starts in years. The Vikings' youth is proving to be quite a hurdle thus far, and the only way to really overcome that is by playing more games. This contest will be televised on KC Metro Sports. Olathe South is on a roll and they will be looking to continue their hot-streak against winless Leavenworth. There’s no official word on the status of Falcon running back Jordan Ward, but his replacement Russell White performed well last week and Ward’s absence shouldn’t be a major cause for concern. Leavenworth will be looking to feed off the energy of their hometown crowd in attempt to finally collect a victory. This game looks like a pairing of two fairly even teams in terms of talent and experience. Free State captured a win last week against Leavenworth, while SM South lost in two overtimes to Olathe Northwest. Obviously a win is more highly regarded, but you could make a case that both teams performed about equal last week. With Olathe North on the horizon in week four, it would be huge for SM South to snag a win here because an potential 0-4 start would be a poor reflection of how the Raiders have performed this season. Which Northwest is best? Thus far the Olathe version has been playing some pretty good football. SM Northwest’s defense will be in for a tough test as they try to slow down Olathe Northwest’s offense which is averaging 448.5 yards per game, good for second overall in the league. The Ravens’ Willie Cauley, at 6-foot-10, will be, literally, the biggest challenge for the Cougar defense. SM Northwest played better overall against SM West but they’ll need to put together a complete game effort this time around if they want to stop the losing. SM East quarterback Dakota Collins is out with a broken ankle and will likely miss around six weeks of action. His backup, Nick Pirotte, played very well in the second half against Olathe East last week and will be taking the reins while Collins is injured. The question that comes to mind is this: if Pirotte plays well in Collins’ long absence, does Pirotte stay on as the starter when Collins returns from his injury late in the season? That question won’t be answered for weeks, but it’s something to keep in mind. Both teams have strong passing games and it could be a good aerial showcase. Neither one of these teams is as bad as a 1-2 record, but one of them will have that distinction following their game on Friday. Lawrence started hot against SM West, but then made some costly mistakes against Olathe South that handed them their first loss of the year. For Olathe East game one against Olathe North wasn’t pretty, but they made a huge jump last week taking out SM East. Last season Lawrence pulled one of the biggest upsets of the year in this matchup, knocking off Olathe East at home by a score of 27-21. We've now sorted out the ON-OE-SME pecking order at the top of the conference in the first two weeks. The question now is where does O South fit into that scheme? Eli says #2? I think maybe #3 but we'll find out on the field at least as they play all three teams. 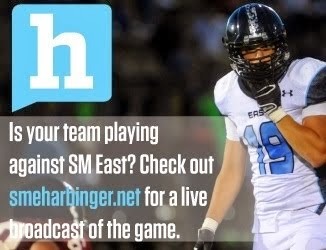 We'll have to wait until next week to begin to answer that question when they face SME. At the North - West game now, ON ripping them apart 27-7...no contest as expected. ON is sure head and shoulders above the rest, I didn't know they were this good. Probably no competition til November in Topeka against Heights. While I'll give you the 15pt win against Olathe East, which was impressive, I refuse to crown Olathe North the East side champions based on the beatings of 2 sub-par football teams. I'm not hating on Olathe North, I do think that they might be the best team in the Sunflower; I just remember last year, when I thought that about Olathe East after they shut the Eagles out in the regular season (that was a 17 pt victory, if I remember correctly, if my math is correct that's 2 points better than North's aforementioned 15 point victory). Turned out come November, it wasn't the case. Long story short, Week 3 wins against sub-average football teams does not equal state title glory. okk well if there sub par teams whos the upper teams of the eastern side of kansas?? I would consider Olathe East, and possibly Lawrence. sry I forgot to post my picks yesterday.